You may still remember me, I bought a plan for a Njord at the end of last year. 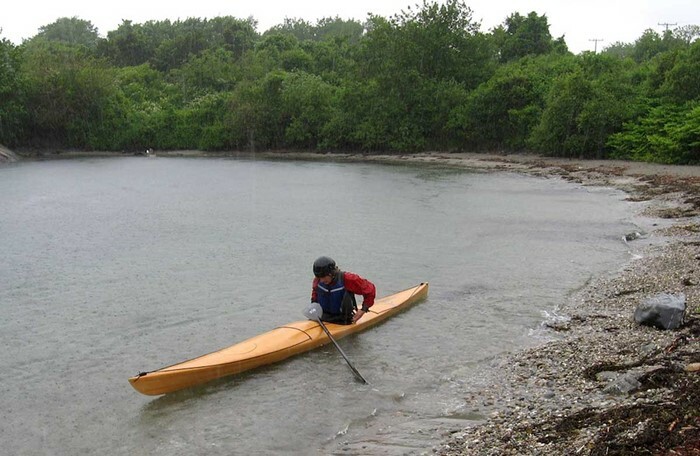 I thought that you would be happy to see a few (not so great, my appologies for that but it was pouring rain, and I did not take those) pictures of the start of my first real paddle in the ocean with it (off of Newport, Rhode Island, USA). I'm very happy so far, but who would not be after spending most of the winter building it ! By the way, the building was (is I should say, since I still have to put a few coats of varnish and finish a few details) definitely one my most rewarding projects. Part of that is because you end up with a unique kayak, that people find beautiful, and that weight way less than composite boats of the same length (I do not know its precise weight yet). PS2. Just a comment on the kayak on the car. I car-top my kayaks stem forward and upside down – improves aerodynamics with a noticeable effect on fuel consumption on long trips, keeps rain, dirt and bugs out of the cockpit, and keeps the stem in view to see that everything is OK up there when going fast (and from a philosophical perspective: isn´t it a little disrespectful to make a nice kayak travel stern first? ;-). With a flat aft deck the Njord sits solidly on a straight rack bar without any fancy kayak holding gadgets. Thanks for your suggestions on car-toping. I did intend to attach it stem first, but when I made the little foam saddles which support the boat, the kayak was upside down and I mixed up the two ends (and that was obviously the day before I went paddling, late at night)... I will fix it soon, though.